Happy Western New Years and Happy Chinese New Years – how fortunate can a person get – we get to celebrate two different new years in one month. Then we get to celebrate Khmer New Years in April. For me, New Years is always a symbol of new beginnings, new hopes and new dreams – it’s a wonderful way to celebrate life itself. 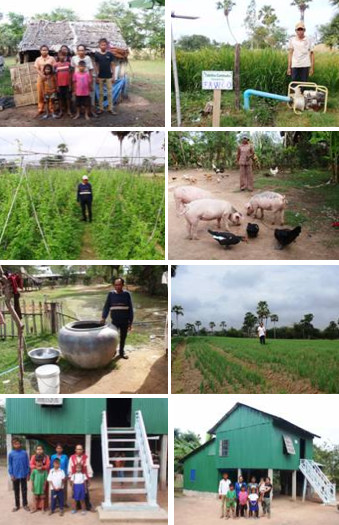 “I’m Kan Thai and my wife is Moeur Thatch I live in Toul Sa La village. I have 5 children there are 2 boys and 3 girls. We are a farmer. I had plant rice and all kind of crops but I can do only 6 months in a year in the rainy season. Fortunately, Tabitha organization came in to my village for help the poor people most of them and me don’t understand how to saving money. After that I got a well from Tabitha organization. When I had well I started plant vegetables in the dry season all the time. This past week I have been to a school that is being built in Kampong Channang – what makes my heart so full is the sight of children – future students participating in the building of the school. It’s a bit of a problem for the contractors but the children are so anxious to have a school – they have bought uniforms and help where they can each day. They are young and full of hope and dreams – what a way to start the New Years. New Years is the time of renewal and dreams – of looking forward – each of you have made those dreams and hopes possible for so many. I thank my God that He grants us all new years so that each of us can dream and hope for the year ahead. Thank you from all of us for that gift.